We were headed to the US military’s Northern Training Area, also known as Camp Gonsalves, which stretches over 30 square miles of Okinawa’s subtropical forest. Founded in 1958 and used for “terrain and climate-specific training,” the US military likes to call the training area a “largely undeveloped jungle land.” What they don’t like to acknowledge is that the forest is home to some 140 villagers, thousands of native species and dams that provide much of the island’s drinking water. Though Okinawans have long opposed US presence on the group of islands, their purpose on this day was to protest the construction of a new set of US military helipads in the forest of the Northern Training Area, which they consider to be sacred. Since 2007, Okinawans have been gathering in Takae to disrupt the construction of six helipads for the US Marine Corps, which come as part of a 1996 bilateral deal between Japan and the United States. Under the agreement, the US military would “return” 15 square miles of its training ground in exchange for the new helipads—a plan Okinawans say will only bolster the US military presence on the islands and lead to further environmental destruction. On December 22, there will be a formal ceremony to mark the return of the land from the Northern Training Area to Japan. Prime Minister Shinzo Abe pledged to complete construction of the remaining four helipads to mark the occasion, and he seems to have kept his promise: Earlier this week, Okinawa’s Defense Bureau and the US military announced the construction had finished. But land and water protectors who entered the construction site last week expressed doubt, saying the construction is far from being complete, and they plan to continue their demonstrations regardless. For the people of Okinawa and their allies, their movement is about much more than stopping the construction of six helipads. It’s about removing the US military from their ancestral lands. From 1999 to 2006, before construction on the helipads began, Takae’s residents twice submitted requests to government agencies to review the project, citing the threat of the accident-prone Osprey aircrafts flying over their communities. Manufactured by Boeing, these aircrafts “combine the vertical performance of a helicopter with the speed and range of a fixed-wing aircraft,” and have a record of crashing. (Most recently, an Osprey crashed off the coast of Okinawa on December 13.) But the government ignored their requests, and, without ever addressing civilians’ concerns or allowing for a public hearing, construction began in 2007. Seeing no political avenues left to protect their land, residents turned to nonviolent direct action soon after, confronting workers on the ground and blocking dump trucks from entering construction sites. In 2014, after the first two helipads were completed, the government halted construction due to the demonstrations. But the government moved forward on the project in July of this year, and demonstrations have ramped up accordingly. “Abe and the US military are here to cut down more of our trees and poison our water,” Eiko Chinen, a native woman told me outside the main gate when I visited the demonstrations. She says the helipads, two of which have already been used for Osprey, will put the reservoirs surrounding the Northern Training Area at risk. The US military has a horrific record of polluting the islands; referred to as the “junk heap of the Pacific” by Americans after World War II, Okinawa’s land, water, and people have been poisoned by the military’s dumping of highly toxic chemicals like arsenic and depleted uranium. Earlier this year, The Japan Times found that the US military’s lax safety standards at another base in Okinawa were likely to blame for the contamination of the local water supply. At the end of World War II, Okinawa came under US control as a kind of war trophy. A 1954 TV series produced by the US Army described Okinawa as, “a vital bastion of the free world,” in spite of its “small size and unattractive features.” It continued, “Its people…developed a primitive, Oriental culture…the friendly Okinawans…took a liking to the Americans from the start.” In the 1950s, American soldiers seized ancestral lands from native farmers with “bulldozers and bayonets” to build military bases throughout the islands, sending landless Okinawans to refugee camps run by the US military. During the Vietnam War, the Northern Training Area became a mock village for soldiers training in anti-guerrilla operations. The 2013 documentary Targeted Village recounts how some of Takae’s villagers, including some children, were made to play the role of South Vietnamese soldiers and civilians during training exercises in exchange for $1 a day. In 2014, a former Marine admitted US troops sprayed the defoliant Agent Orange in Takae, which has also been found throughout the island. It wasn’t until 1972, twenty years after the US Occupying forces withdrew from Japan, that the islands were “reverted” back to Japanese control. Yet Okinawa still hosts 74 percent of the US military bases in Japan, despite being only 0.6 percent of its territory. Since 2015, the Japanese government has pushed the construction of another US Marine Corps base in Henoko, a coral-rich bay in northern Okinawa, despite massive demonstrations against the relocation plan that continue today. “Abe won’t meet with the Okinawan people, but he’ll go and meet Trump right away,” said Satsuko Kishimoto, a native woman who has been coming to the sit-ins for over three years. “That man isn’t even a politician yet!” That day, Kishimoto grabbed the microphone at the sit-ins, calling on the Japanese government to bring the bases back to the mainland if it really needs “deterrence.” “We’re not going to leave the fate of Okinawa to a bunch of politicians in Tokyo,” she said. In the long struggle to defend the forest, the encampment has grown to include allies from outside Okinawa. It has become a place of community, where Okinawans and their allies stand together against an increasingly militarist regime. During one of the sit-ins, a group of activists from Incheon fighting the US military presence in Korea visited the encampment in a show of solidarity. On another day, survivors of the ongoing nuclear disaster in Fukushima sat with land and water protectors. A conservative who has expanded Japan’s military and its partnership with the US, Shinzo Abe and his administration desperately want to hide this resistance. 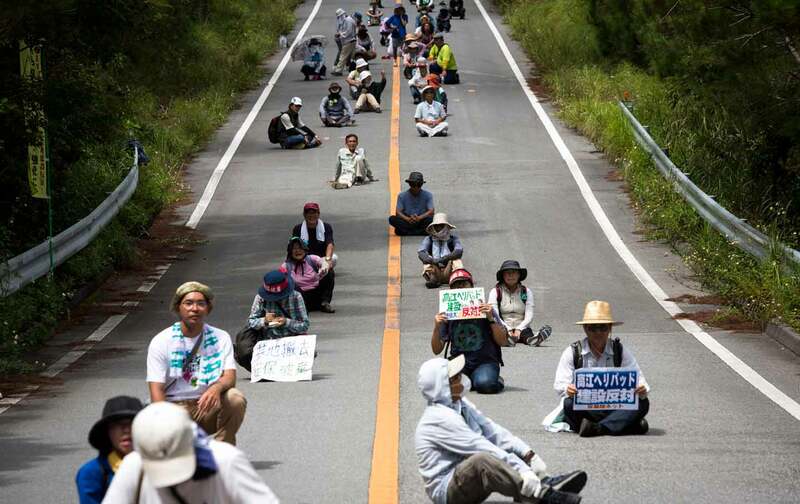 Since resuming construction on the four remaining helipads in July, the Japanese government has sent over 500 riot police from across the country to break up the peaceful protests. In November, the police raided the Okinawa Peace Movement Center, an anti-base organization that has been active in demonstrations across Okinawa, obtaining information on those involved in the protests; they arrested its chairman Hiroji Yamashiro and three other activists for piling concrete blocks to keep trucks from entering Okinawa’s Camp Schwab back in January. The US military has also conducted surveillance of Okinawan land protectors as well as journalists reporting on them, according to documents obtained by journalist Jon Mitchell under the Freedom of Information Act. War looms large in the minds of the people in Okinawa. When Japan first annexed the Ryukyu Kingdom in 1879, the Meiji government imposed a brutal assimilation policy on Okinawans—similar to those in Korea, Taiwan, and China under Japan’s Imperial rule—that tried to eliminate indigenous culture, including the Ryukyuan languages. When Japan entered WWII, the islands quickly became a battleground—an estimated 150,000 indigenous inhabitants lost their lives in the Battle of Okinawa, considered one of the bloodiest battles between Japan and the United States. Whether or not construction on the helipads has been completed, that mission will continue. On Tuesday, seven villagers from Takae, including the ward chief, visited the Okinawa Defense Bureau to demand the withdrawal of Osprey. Last weekend, some 900 demonstrators gathered in Henoko to demand the withdrawal of the US Marine Corps aircrafts and oppose the construction of helipads in Takae and the new base in Henoko. And the demonstrations outside of the main gate in Takae show no signs of stopping. Editor’s note: An earlier version of this piece stated that Hiroji Yamashiro and three other activists were arrested for blocking entrance to Futenma Air Station. They were blocking Camp Schwab. The piece has been updated.